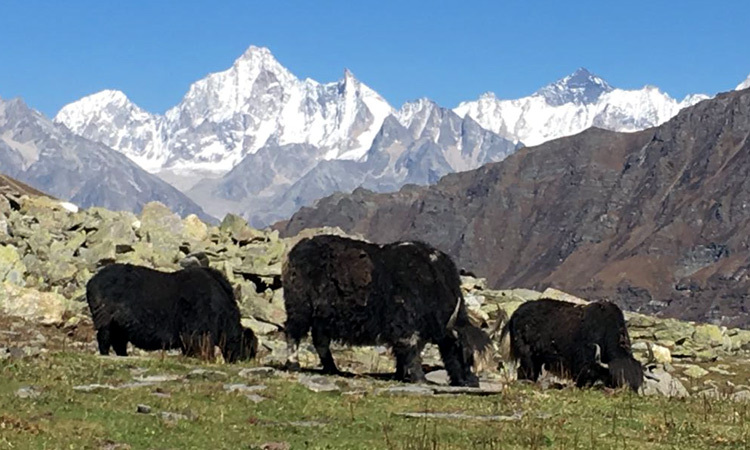 Rupin Pass is your quintessential Himalayan trek. Falling in the Moderate-Difficult category, it does test your endurance, but the rewards are gratifying to say the least. The gradual ascend in the altitude is complimented by the change in scenery at every dawn of the day !!! 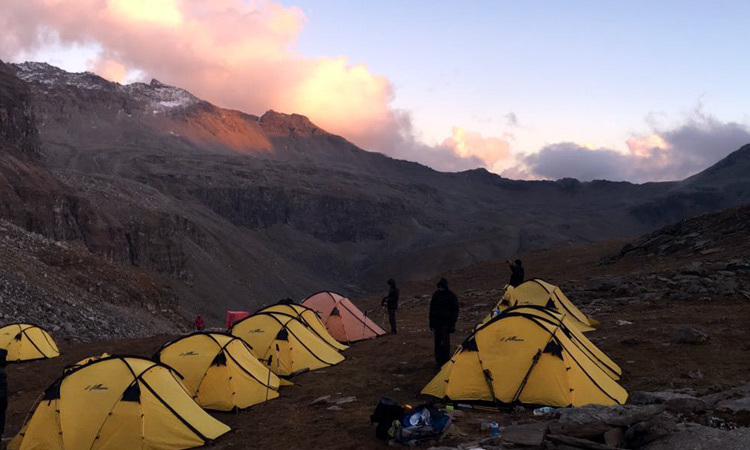 Green river beds, beautiful campsites, hanging villages, dense cedar forests, mesmerizing grasslands, jaw dropping views of the majestic Kinner Kailash range..Rupin Pass trek is an amalgamation of all the ingredients a trekker can ever dream of !!! The constant companionship of the gushing Rupin river till its legendary three staged water fall will only act as a healer to all your rigors and challenges!!! 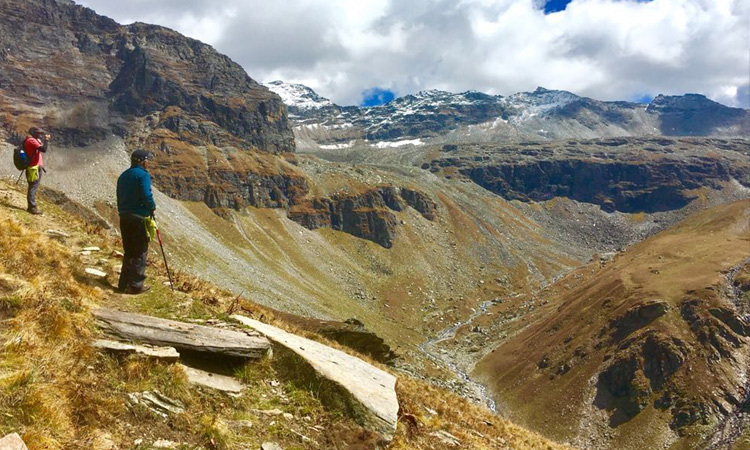 And at the end of seven days of laborious trek, the thrill and the sense of achievement a trekker gets standing at the pass, staring at the majestic snow clad peaks !!!! Well..some things cannot be explained..They can only be experienced !!! So pack your bags, and get set for the trek of your life !!! If you haven�t done Rupin Pass, you haven't done anything !!! Reach Dehradun by early morning. The journey till Dhaula takes about 10-11 hours to complete.You'll drive through the charming hill station of Mussoorie, before passing Naugaon, Purola, Mori and Naitwar. The veichle will halt at regular intervals for breakfast and lunch. 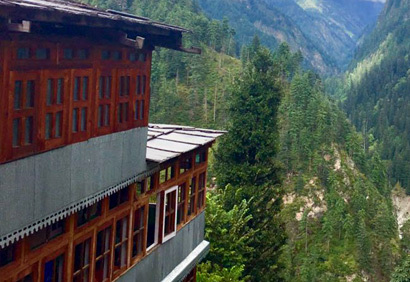 Throughout the way, you'll be accompanied with thick pine forests and the serpentine roads cutting across some remote regions and breathtaking valleys. This is undoubtedly one of the prettiest drives you can undertake anywhere in the Himalayas. As you start approaching Dhaula, you'll notice the gradual dip in the temperature. It'll be close to sunset by the time you reach the sleepy little village of Dhaula. 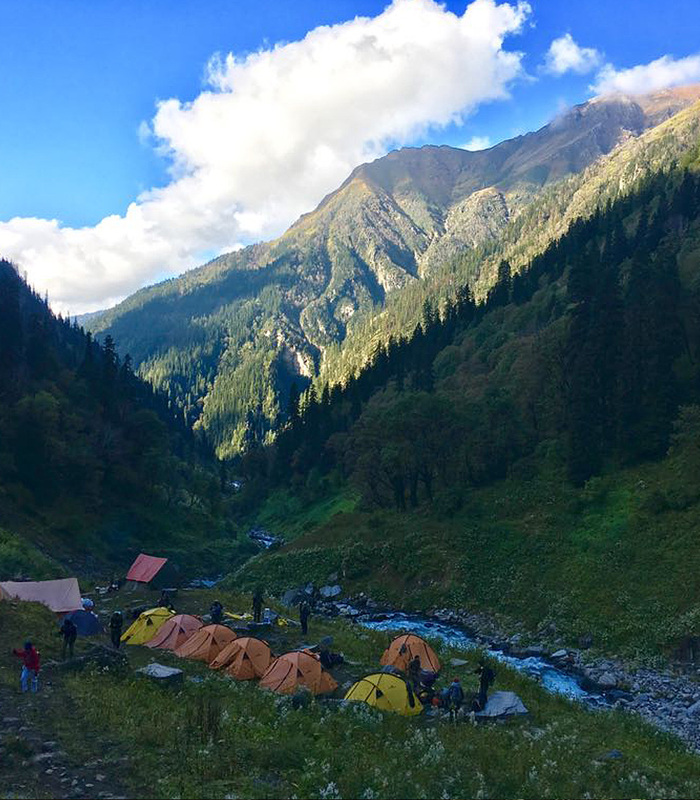 The campsite is located right at the edge of Rupin river, your constant companion for the next few days. The trek starts on a trail along the Rupin river with a steep ascend for a few hundred meters. It gradually reaches a level path, and makes its way into the Dhaula village. You can now view the river clearly with all its might and ferocity. Leaving the Dhaula village behind, you venture deep into the unspoiled wilderness. 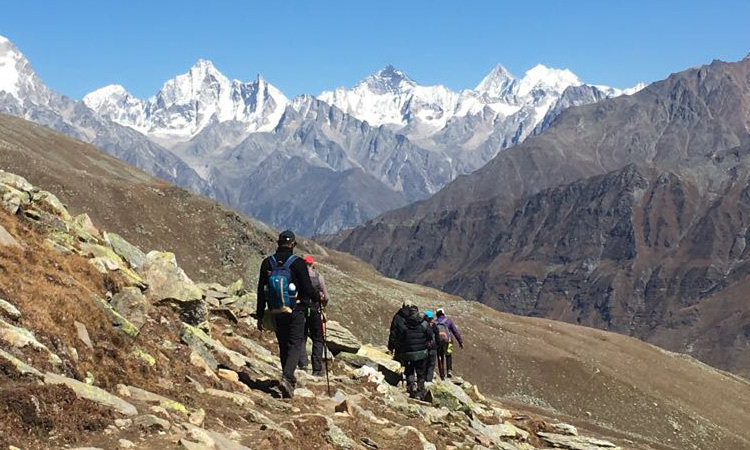 The trek is a mix of few steep ascends with a gradual dip, and then an even trail perfect for enjoying the stunning scenery. A few hours into the trek, you will come across a small tea shop in the middle of nowhere. A great spot to loosen up a bit , and enjoy a simmering cup of tea !!! There will be a continuous view of deep valley and towering peaks on your right throughout this stretch. You'll reach the village of Sewa well before sunset. Its a really small village hidden in the lap of the mountains. The smiling kids and the charming locals are solely dependent on the nature for their daily needs. Settle in your homestay, and take a walk across the village. The village's two stores beautiful temple, dedicated to Karna, is a must see structure. Built with a blend of local and Kinnauri architecture, the wooded structure is adorned with medals and intricate carvings. You could also see some old relics and old coins engraved on the walls. You start with a deep descend through a deep forest, right to the river bed. This is a beautiful place to take a break and enjoy some great moments taking photographs of the gushing river. From this point, you again catch an ascending trail to probably one of the most important spots of the entire trek, the iron bridge separating the states of Uttarakhand and Himachal Pradesh. Another great spot to take out your cameras !!! Crossing into Himachal, you trek through a deeply forested trail till it opens up at the motorable roadhead of Gosangu. Gosangu is nearby the village of Dodra, from where one get buses to Rohru, and then onwards to Shimla !!! You keep walking on the trail further, and cross two bridges, one wooden and one an iron one. Further up, the trail becomes narrower and its a steep ascend from here on till you come right in front of a towering waterfall. Its a beautiful double layered waterfall, and a great place to have lunch and some amazing photographs. From here on, the trail becomes even. This is a beautiful stretch with some gorgeous views of the deep valleys down your right !!! 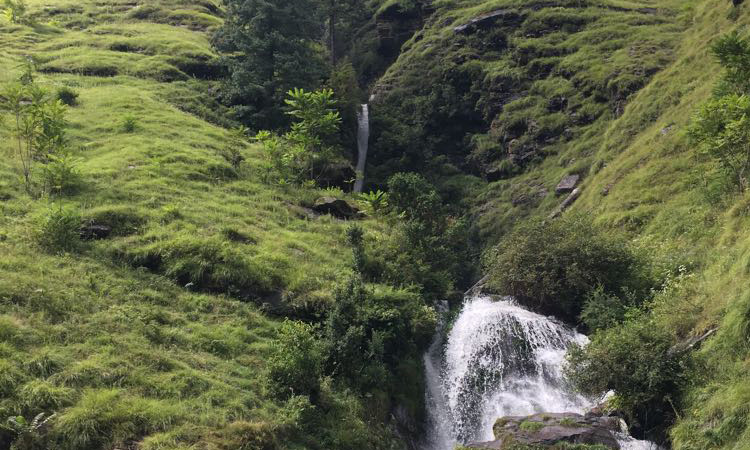 Your next stop is a place at the edge of a gushing river stream, called Raj Gad. It is from this point that an hour long steep ascend begins towards the Jiskun Village. Jiskun is divided into two parts : Lower & Upper. 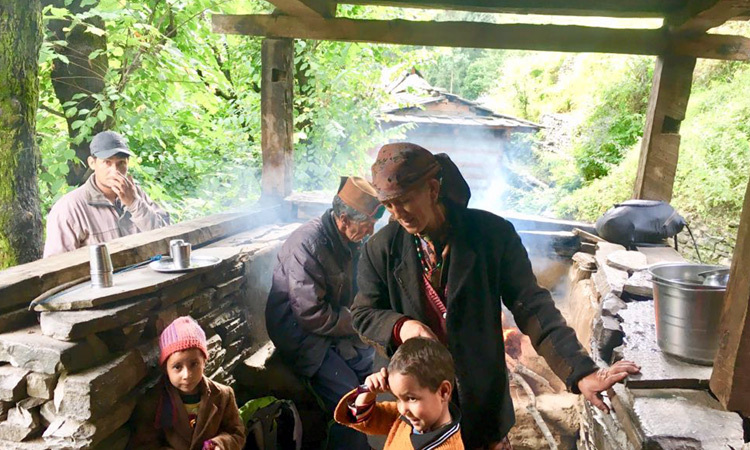 You will come across a small eatery on the main trail entering Lower Jiskun that serves tea and snacks like Maggi and Omlette. A great place to rejuvenate yourself. Upper Jiskun lies further half an hour ahead !!! From Jiskun, the trail goes downwards through a dense deodar forest till you once again come on the edge of Rupin river. Its all uphill from here on. The trail cuts right and you walk on a narrow trail cut out of a rock face !!! Its a steep ascend from here on, and an energy sapping climb of half an hour will bring you at the gates of a tea shop, a much needed rest point. Take a rest and continue the ascend that brings you to the charming village of Jakha. Jakha is much bigger than all the villages that you crossed before on the trek. 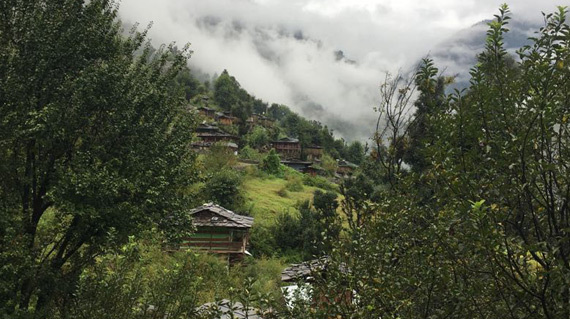 It also happens to be the last village till you complete the trek at Sangla !!! As you leave Jakha, you walk across open reaches of Upper Jakha before entering the magnificent deodar forests, one of the most beautiful stretches of the entire trek !!! The trail is cocooned by towering centuries old deodar trees that have stood still withstanding the sands of time. You will even spot some maple trees, with their golden orange leaves, in the midst of theses deodars !!! 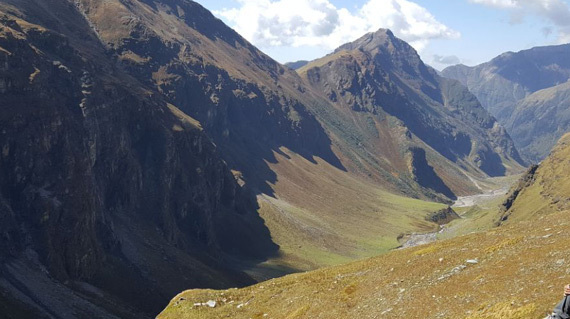 The descending trail will again bring you towards the bed of Rupin river, which even happens to be your lunch point for the day. 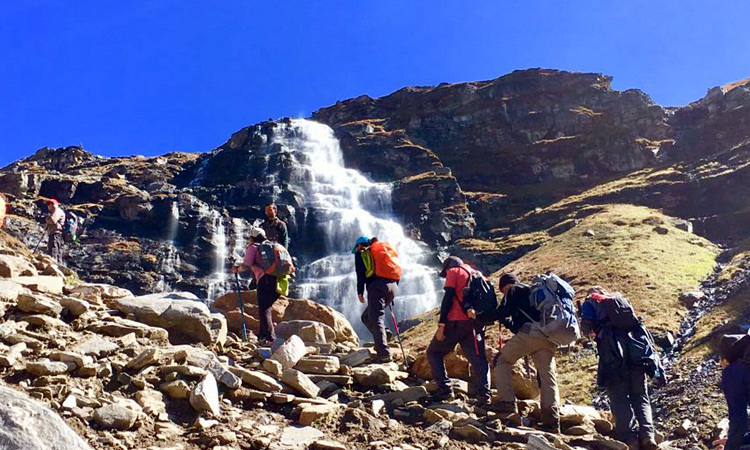 In the May-June season, you will cross on to the other side by walking on a snow bridge, that is one of the most thrilling aspect of the trek. In the Sep-Oct season, the snow bridge melts, so you'll have to again use a wooden bridge to cross the gushing river !!! From here, its a walk of around 2 hours to reach the campsite for the day. The scenery now opens up, and the deep forests now give way to flowery grasslands !!! You will need to walk through boulders of every shape and size, and will come across various gentle streams that make their way towards the ruin that flows towards your left !!! Today is probably the most leisurely and hassle free day of the entire trek. The trail is much even compared to the other days, so you cover the distance with minimum fuss..
You enter a deep forest within a few minutes upon leaving the campsite. And then in a moment, you find yourself surrounded with a vast bed of blooming multi colored rhododendrons. 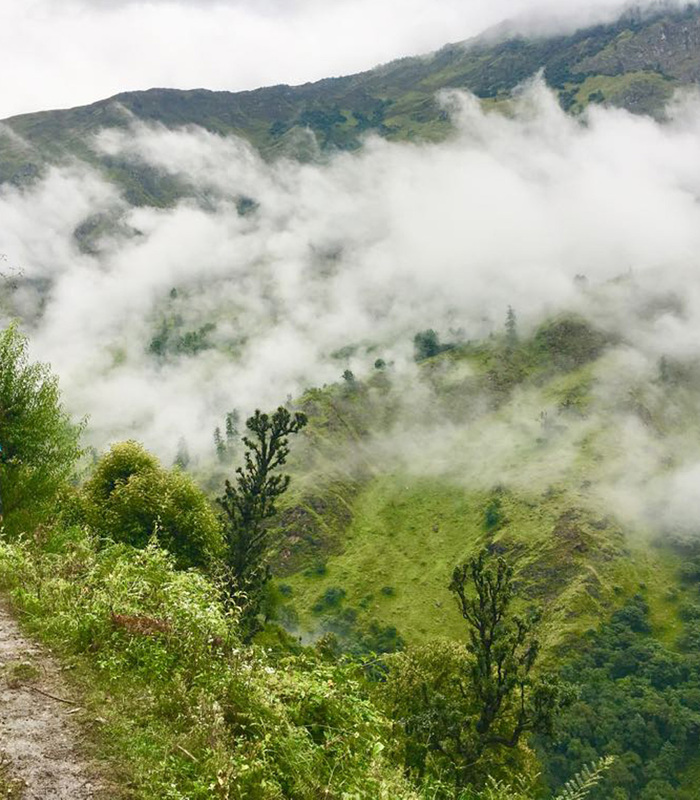 This is undoubtedly one of the most picturesque stretch of the trek. And in between this colorful extravaganza, you will come across several small streams making their way towards the giggling ruin on your left. As you keep walking ahead, you will see the bushes and the trees gradually giving way to vast lush green meadows. And then, the moment every trekker eagerly awaits !! 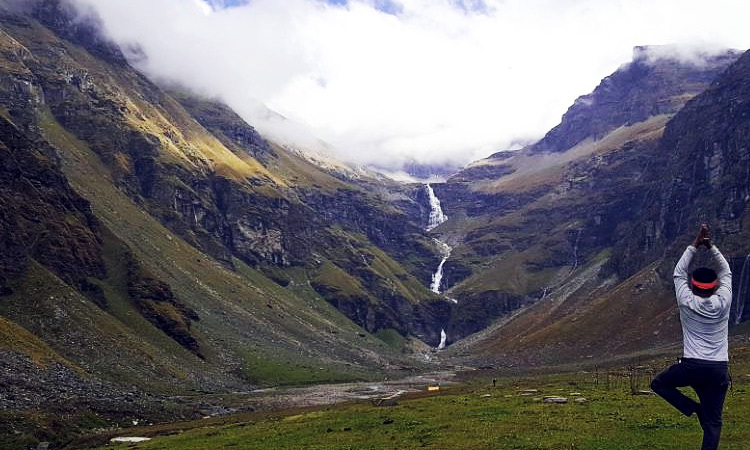 The first sight of the Rupin waterfall is bound to blow you away with its sheer grandeur and magnificence. Its like watching a movie in a cinema hall !! The three layered waterfall sits in the middle of a U shaped valley, the mighty Dhauladhar Range beyond, hundreds of tiny falls coming down from all the sides, and finally meeting the Rupin river guggling through the lush green meadow !!! It cant get any better than this !!! You will find numerous small streams cascading through the meadows, running towards the river. As you proceed further, the waterfall becomes bigger n bigger, making you reach for your camera at every few steps !! 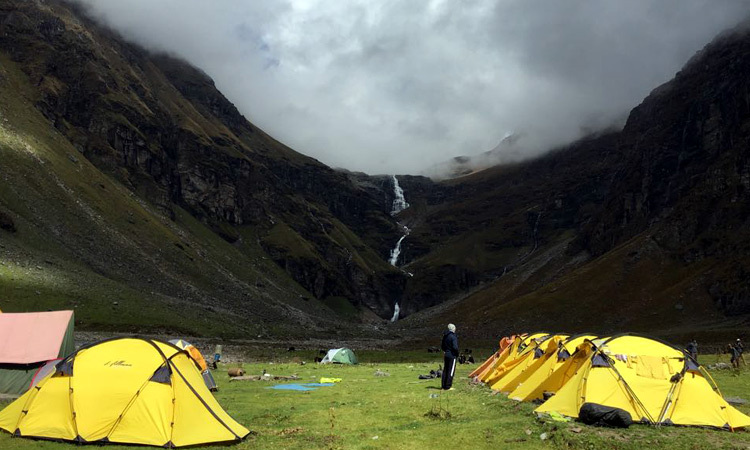 The Lower Waterfall Campsite, also known as Dhanderas Thatch, is considered by many as the most beautiful campsite of the Indian Himalayas. And rightly so !!! As you stand outside your tent and take a 360 degree round, you cannot help yourself feeling dwarfed by the enormity and the grandeur of the heavenly surroundings. Your state of mind ??? 'Speechless' !!! You finally get to climb the fall you had been admiring since the last two days !!! 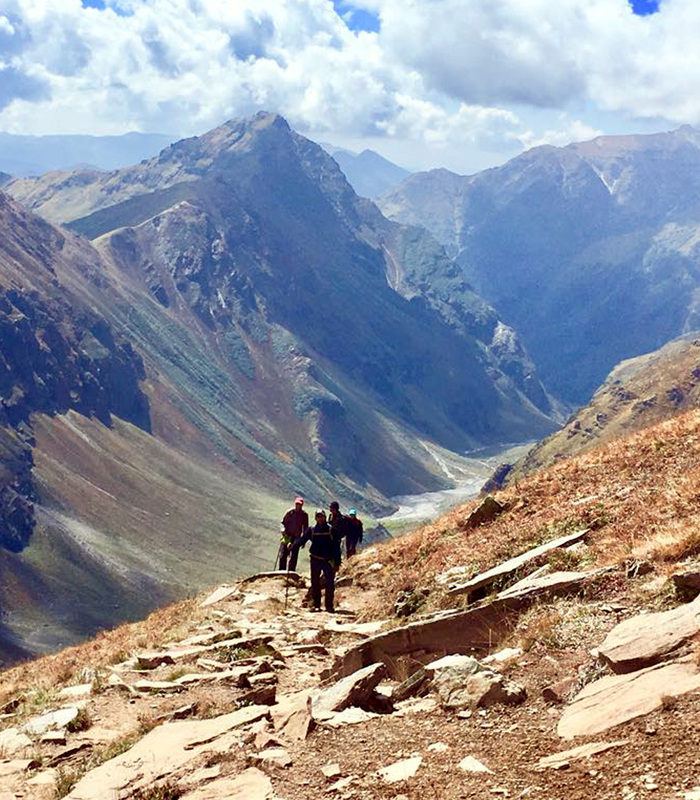 The trek is less arduous than it looks, and involve a moderate ascend throughout. The distance is not that much, so you have the luxury of starting at leisure. 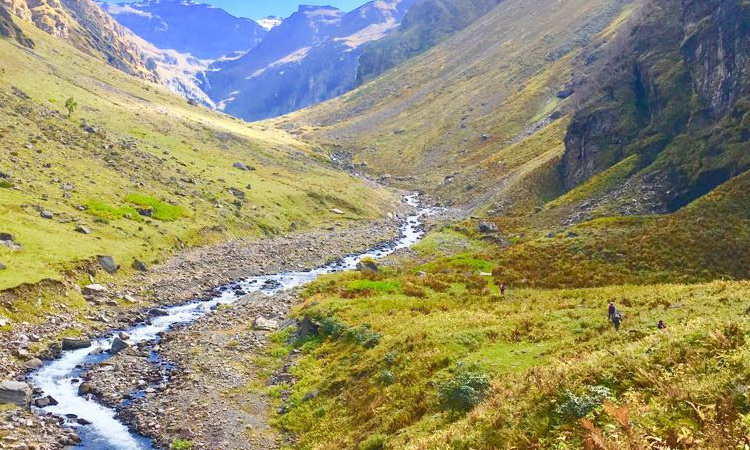 You need to trek for about a kilometer hopping above the several tiny streams passing across the way to reach the base of the waterfall. This is the point from where you cut to your right and start the actual ascend. In the May-June season, the entire area would be sprinkled with 'snow patches', which you need to cross with utmost care and precision !! The crossing of the waterfall from its left to the right happens at its middle level. The snow bridge crossing has got all the ingredients to become a life time experience for the trekkers !! Standing at the middle of the bridge, with the sight of the cascading waterfall on your right, and the vast and seemingly unending Ruin valley to your left is bound to leave you speechless and awe struck. Cross the bridge and you reach an amazing spot to capture some mesmerizing views of the waterfall up close !!! The remaining journey till the top is covered on the right of the falls. It takes about half an hour to reach the top from this point. The joy of reaching the top of a structure you had been staring at since the last few days just cannot be explained, it can only be experienced. The view at the top is certainly not what you had expected from down below !! You will come across a vast meadow with numerous streams coming together and eventually forming the Rupin waterfall swirling 1000 ft down !!! Grab a place right at the edge of the waterfall and watch it crashing down right in front of your eyes !!! And how about spotting the place where you pitched your tent at the Lower Waterfall campsite !!! Its the last time you have a glimpse of the surreal Rupin Valley, your playground for the last 6 days, as tomorrow you start your journey towards the bemoaning Sangla Valley !!! The longest and the most difficult day of the trek awaits you !!! Todays the 'Pass Crossing' day, and the thrill just wont let you sleep properly !! Its advisable to start in the wee hours, taking into account the long journey lying ahead. You get a packed breakfast to be had standing on top of the Pass itself !!! The trail to Rata Pheri is a steep ascend for about an hour. The path is quite rocky and you need to take care of boulders of all shapes and sizes on the way !! The vast camping fields of Rata Pheri is the point where the trekkers camp in the Sep-Oct season (Instead of Upper Waterfall). There is a stream passing by at this spot, so its advisable to fill your water bottles to the fullest !!! It is at Rata Pheri, where you get the first glimpse of the Rupin Pass, slightly above the narrow 200m gully far away. From this point, the journey till the Pass can be divide into two stages : Crossing the huge field (a big snow field in May-June) and climbing the Gully till the Pass !! In May-June, the field like an unending white !! Its snow and just snow wherever you look. It takes about 2 hrs to reach the Gully. These two hours are quite demanding, keeping in mind various phases where your foot will be sinking unto your thighs in the soft snow !!! Its advisable to put on your gaiters from Rata Pheri. In the Sep-Oct season, it will be an open field sprinkled with boulders here and there. The starting point of the gully is the perfect place to stretch your backs and gather your breath, as the climb is going to test your endurance to its limits !!! It might not look that long, but the steep ascend at that altitude is what makes it tricky. And add to that the danger of falling stones !!! But the continuous sight of the Rupin Pass will keep boosting your morale for the entire stretch !! And finally !!! The moment you were eagerly waiting for finally arrives !! 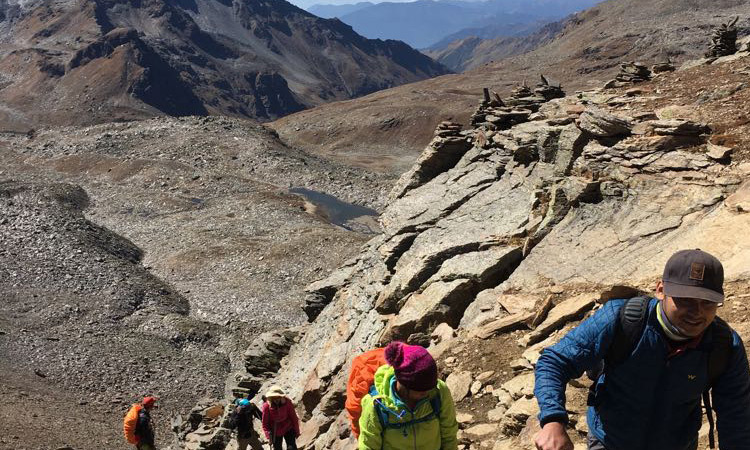 All the hardships and bruises are laid to rest the moment you cross the gully and put your first step on the 15,300 ft high Rupin Pass. The strong winds, the fluttering prayer flags and the sights of the majestic snow clad Dhauladhar Ranges just sway you away with their ethereal charm and elegance. The experience of standing right at the top, in the middle of that bewitching 360 degree panorama, stays on with you forever !!! A great spot for some out of the world clicks !!! From here on, its all going down and down !!! In May-June, trekkers have the luxury of sliding down on snow for around 500 ft !!! No such luck in Sep-Oct though. The descend towards Sangla Valley is more steep compared to the other side. You need to be extremely careful while placing your foot on the slippery rocks !!! After about an hour, the terrain becomes flatter and easy to walk on !!! You will find numerous streams on the way to take care of your thirst. Around 3 hours of a leisurely walk brings you to the last campsite of the trek, Ronti Gad !!! Its another day of descending down the hills !!! it may look easier compared to the huffs and puffs of ascending, but its certainly not !!! The strain involved with the continuous descend put you knees to litmus test, so its advisable to keep taking break at regular intervals. Its a great day to witness the gradual change in scenery. The rocky terrains give way to serene pine forests of the Sangla/Baspa Valley as you approach the Sangla Kanda (Kanda means 'Upper Reaches' in the local language). You slowly get back to civilization with small villages coming into sight. Village kids greeting you with a 'Namaste' surely brings a smile to your jaded faces !!! As you get closer to Sangla, your mobile networks start coming into existence. The sounds of your cellphone bring a sense of joy to some, while that of a despair to others !!! Look out for some beautiful Apple orchards on the way !! As you approach Sangla, the trail goes down towards the bridge over Baspa River. Cross the bridge, and take the trail that brings you onto the main Sangla-Chitkul road !!! The trek finally ends, but the beauty, the surprises, the emotions stay on with you..Forever !!!! - Camping tents (triple sharing basis), Sleeping Bags, Carry Mats. - Nutritious and healthy vegetarian food. (Starting with dinner on the first day and ending with breakfast on the last). - Support staff for Guidance during the trek. - Transportation cost from Delhi to Dehradun and return. - Transportation cost from Dehradun to Dhaula and return. It can, however, be arranged.